People around me have not stopped talking about Hereditary and how it’s the scariest film ever made, guaranteed to make you weep with terror. And I’ve nodded along with these claims, but really only to keep the peace. Because I, for one, know the scariest film ever was already made back way in 1990. 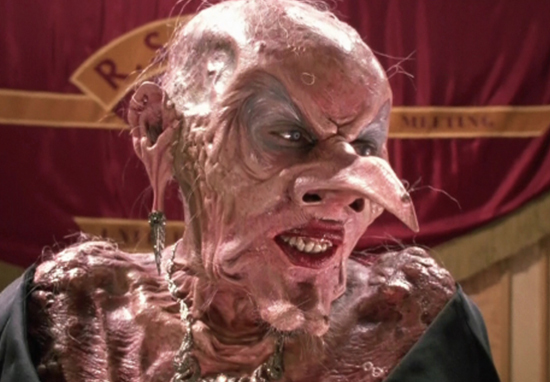 I’m talking of course about The Witches, a strikingly disturbing adaption of Roald Dahl’s 1983 nightmare fodder. I can still remember my heart actually stopping in horror when I realised the little girl was actually trapped in the painting forever and none of the adults were able to rescue her. And when Anjelica Huston took that mask off, well, my parents may as well have just have whacked on the more child-friendly Nightmare on Elm Street instead. Now a new adaption is on the cards, sure to petrify a new generation of kids from ever, ever peeking in on a Women’s Institute (WI) meeting. According to Variety, Back to the Future director Robert Zemeckis is currently wrapped up in final negotiations to direct a remake and it is anticipated a deal will be made soon. Multi-talented Zemeckis will also be writing the script. His partner Jack Rapke will be producing through their banner ImageMovers, alongside Alfonso Cuaron and Guillermo del Toro. Interestingly, Del Toro was originally in the director’s chair, but had to pull out due to scheduling commitments. Can you even imagine how intense this adaption would have been? So what can we expect from this latest spooky offering? According to Variety, sources say this version will be more faithful to the novel. Roald Dahl was reportedly not a fan of the nineties movie, and didn’t approve of the switched ending which was actually less dark than the book. Indeed, he described it as being ‘utterly appalling’ and even tried to have his name removed from the credits. Grandmamma loves to tell about witches. Real witches are the most dangerous of all living creatures on earth. There’s nothing they hate so much as children, and they work all kinds of terrifying spells to get rid of them. Imagine thinking you can improve on The Witches. May Grand High Witch Anjelica Huston throw a drink in your face. I rewatched the movie not that long ago and I still can’t believe how scary it is. The makeup effects are still so good. Dahl reportedly would have also preferred Cher to have stepped into the toeless shoes of The Grand High Witch rather than Huston, and indeed she would still make a great casting choice. Could this be the perfect opportunity to turn back time and give Dahl the villainess he wanted all along?